In the early 1930’s an ambitious young man was hard at work driving his bread truck on his daily route. He was doing his best to keep food on the table for his young family. But in his heart he knew he wanted more. Coming from a family of roofing laborers he knew the fundamentals of roofing and he knew it well. He had the experience to install a good roof, one of high quality and expert workmanship. Elmer W. Matthews was a hard working, dedicated man, who put his best efforts into giving Chicago the best roofing services available. 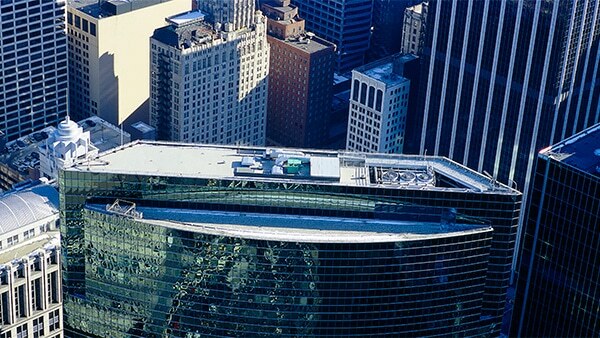 Confidence in the quality of his work and the integrity of his business methods soon earned Matthews Roofing one of the highest reputations in Chicago. 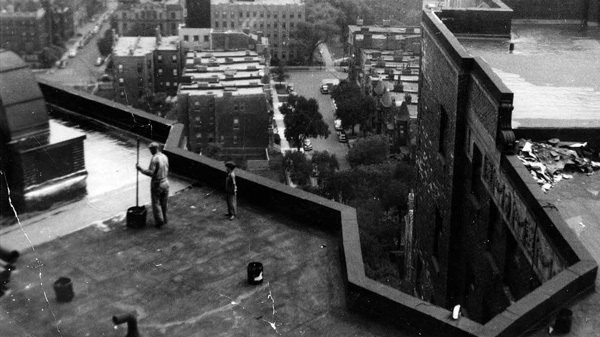 In the early 1930’s material for roofs were put on top of low-sloped and steep-sloped wood roof decks. The materials used for flat roofs were made out of organic rag felts, and the glue to laminate the sheets together was made out of coal tar pitch. This in turn was covered with either slag or gravel surfacing. The equipment used to hoist the materials was made up of a hand-powered pulley wheel and beam system. This system is still in use today on certain small jobs. The fuel that was used to heat the coal tar in a kettle was kerosene. 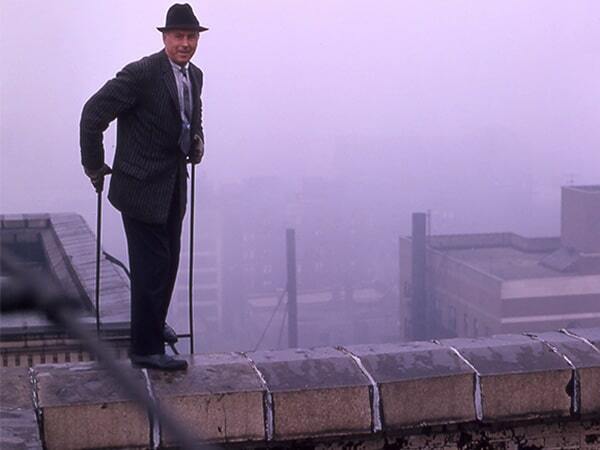 In the 1940’s jobs were scarce and so was any new technology for roofing systems. 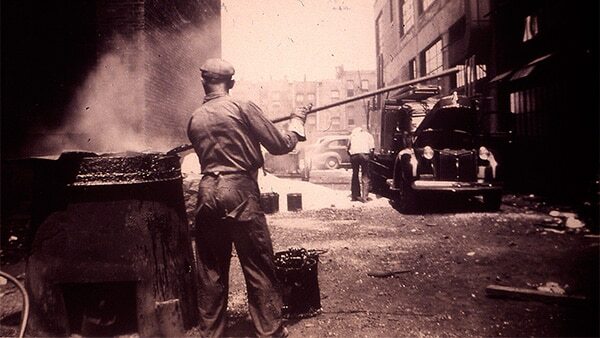 Coal tar pitch was the roof system of the era and little was known about anything else. Each roof system was created with the materials available at the time. Even though modern roof technology was limited or next to none, these roofs in the past sometimes lasted for up to 40 years. In the 1950’s new construction methods came in the way of new types of roof decking, and dead level roof systems. Metal roof decking and Gypsum roof decks were more prevalent and required a roof insulation overlay. This was a cost effective way of construction back then and today. The type of insulation used in this era was of a low-performance type and was made of many different organic materials such as vermiculite, wood fiber. The roofing material also changed from rag felt content to a paper pulp material. This again was a cost saving method that lowered the life cycle of these roofs. The bitumen used for inter-ply adhesion and waterproofing was also substantially reduced in quality. In the 1960’s the normal roof system consisted of three or four ply of asphalt with paper felts with either asphalt or gravel surfacing. Perlite” a natural occurring volcanic rock”, and wood fiber insulation was the norm. Roof mounted HVAC units started to aggravate the life cycle of these roofs in the low slope market. Interior roof drains and expansion joints were on the rise. Roofs would typically last for about 20 years or less. With the invention, and purchasing of material handling, hoisting, and installation equipment Matthews Roofing was able to increase productivity. In the 1970’s roof systems prior to this lacked the longevity of the past, and other systems began to emerge. In about 1974 the oil embargo added to the push for something new other than oil based bitumen roofing. This included Modified Bitumen, EPDM and Thermoplastics. In efforts to conserve our natural resources, new higher R-value insulation came on the market. Tapered insulation is also used now more than ever to help alleviate the problems found with dead level roof systems. The United States government banned all asbestos roof systems and fiberglass replaced both asbestos and paper felt. About then we began to outgrow our facilities and built a larger warehouse and office space of approx 55,000 sq. ft. Our first customized computer system carried out many of our clerical duties. Our roofing crews and fleet tripled in size to 20 units. In the early 1980’s inflation took its toll on contractors, where only the best could survive. It had become common to roof over existing systems many times over adding to the reduction in roof life. 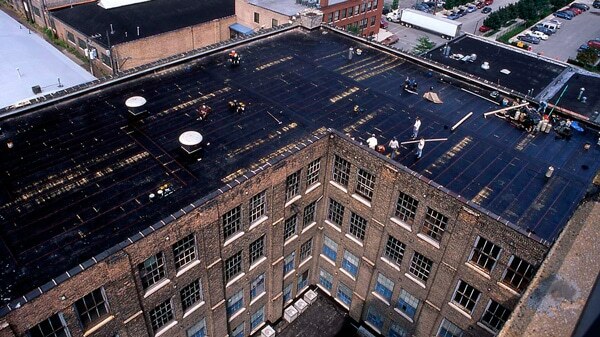 Many larger rubber-roofing manufacturers started to increase their warranties. Roofing products and their methods of installation continued to improve. Aesthetics started to become popular with many new and older methods of roofing. The United States government became more involved in regulations in the construction industry. These government agencies including DOT, EPA, OSHA, help protect customers, construction workers, and the environment. Major Cities and villages require contractors to abide by building codes; many use the BOCA National Code ie “Building Officials & Code Administrators International, Inc.” In 2006 BOCA changed its name to IBC “International Building Code” which is a member of ICC “International Code Council. Permits and Licensing are also required. Matthews Roofing continued to keep up with the latest technologies and methods of installations. Roofing tear-offs and replacements were specified more than ever before. In the 1990’s materials and specifications from manufacturers continued to improve. 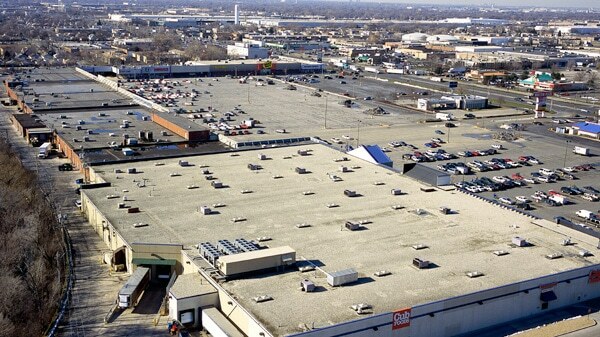 Roofing suppliers were giving superior service to keep contractors on schedule. Single ply systems, ballasted, mechanically attached or fully adhered were taking over the marketplace. Insulation R-value increased with as little as 2.7” creating an R-value of 20. More penetrations found their way to the flat roof tops including but not limited to: Exhaust systems, expansion joints, HVAC units, plumbing pipes and roof drains, satellite dishes, grease traps, roof deck pavers, observation decks, and green roofs. The new roof system membranes can more easily accommodate expansion and contractions and roof deck deflections. Matthews Roofing has been certified by many of the top manufacturers in the world today. 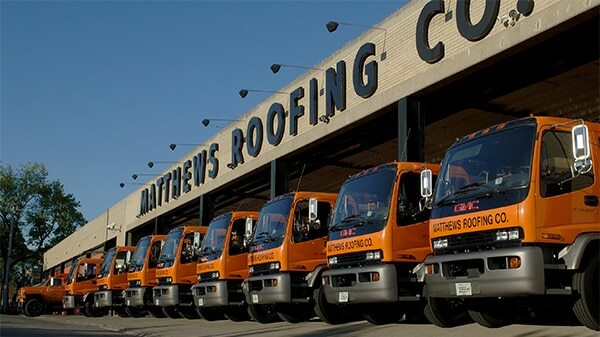 In the 2000’s Matthews Roofing is still the original family owned and operated company. Four generations of satisfied customers have kept our reputation strong. We have over 80 years of experience in the roofing industry. 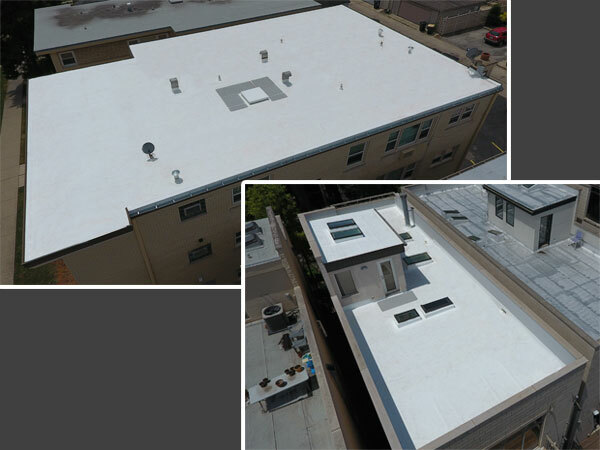 It is with this experience and combined knowledge of the industry’s constantly changing technology, which we can provide to our clients with long lasting, and cost effective solutions to their roofing needs. A well established and secure company, Matthews Roofing is there for the long term commitment to all of your roofing needs, from now and in the years to come! As much as Matthews Roofing loves to highlight only the large impressive projects, we thought we would display some smaller roof projects. 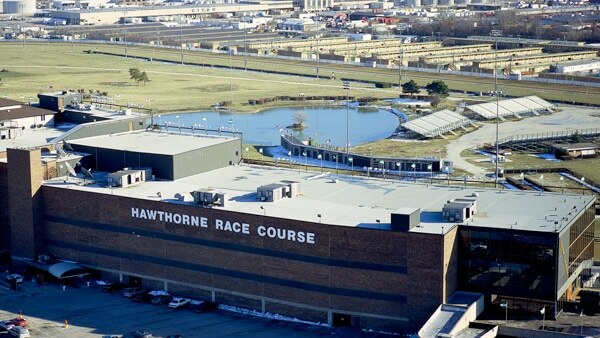 Matthews does service a very wide variety of roof systems and a wide variety of shapes and sizes from a sprawling industrial roof to a two flat roof and everything in between. We do our best to service each and every customer with same care and professionalism. We also understand customers have different budgeting needs. In this day and age the name of the game is different options to meet each roofing need. 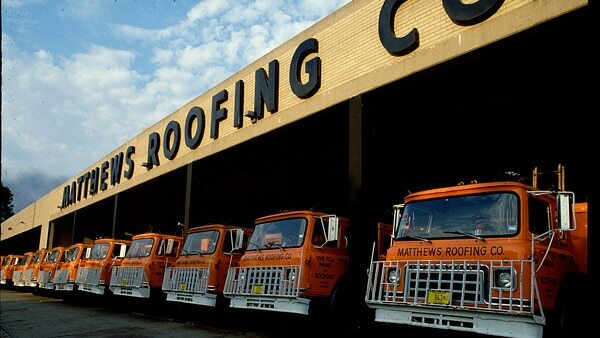 We know if we service your roof well now, it means roof work in the future for Matthews Roofing.